In my house, we love taco night. I'm not talking authentic tacos, either. The real Mexican variety: chopped meat, rolled in double corn tortillas, topped simply with cilantro, onion, and lime? They're delicious. But who doesn't have a soft spot in their heart for Americanized tacos? We love flour tortillas, ground beef spiced with cumin and chile powder. Shredded cheese, sour cream, lettuce, and tomatoes on top? Yes, please. Taco night is generally a simple meal. It's a matter of assembly more than cooking. Although I make my own seasoning in advance, everything else can come out of a package. That's where these tortillas come into play. They come together with approximately ten minutes of active time, and the flavor is so worth it. 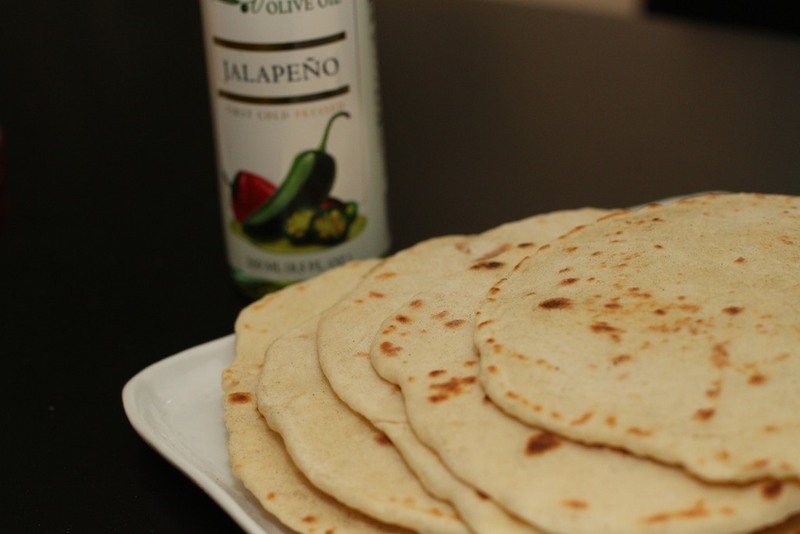 These tortillas pack a subtle heat and terrific flavor from the oil. Tortillas from a bag will never again suffice. In a medium bowl, stir together the flour, baking powder, salt, and jalapeno oil. Add the warm milk and stir until the mixture forms a shaggy ball. Turn out onto a lightly floured surface and knead until the ball comes together. Cover tightly with plastic wrap and let it rest for 20 minutes. After the 20 minutes have passed, divide the dough into eight equal balls. Place them on a lightly floured or greased surface (I just use the cutting board) and cover. Let them rest for another 10 minutes. Meanwhile, preheat a skillet over medium-high. Using a rolling pin, stretch each ball into a disc as flat and wide as you can make it. Cook them on high for no more than one minute on each side. The tortillas will develop brown spots when they're done. Try to keep warm, and serve them as soon as possible.